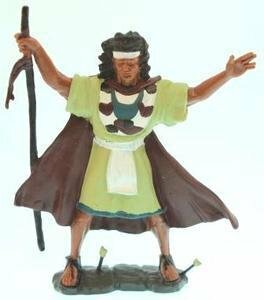 3" Samuel the Lamanite, made out of durable vinyl. Samuel the Lamanite was courageous, obedient, and faithful to our Heavenly Father. He warned the Nephites in Zarahemla that unless they repented and turned to God they would surely be destroyed. The Book of Mormon tells how the people became enraged and tried to kill him. Although they shot arrows and threw stones at him, the power of God protected him and he could not be harmed. Ages 4 and up.